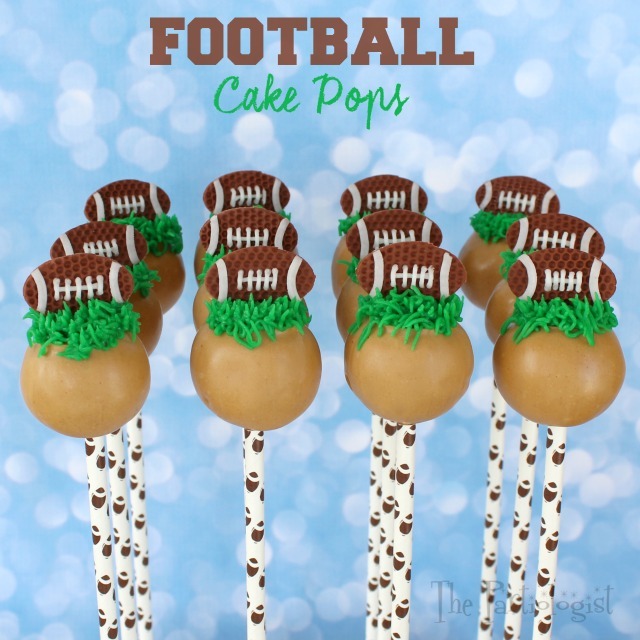 The Partiologist: Football Cake Pops! I burnt the stadium. Yep, that's right, I had big plans to show you my beautiful stadium cake all decked out for the super bowl. 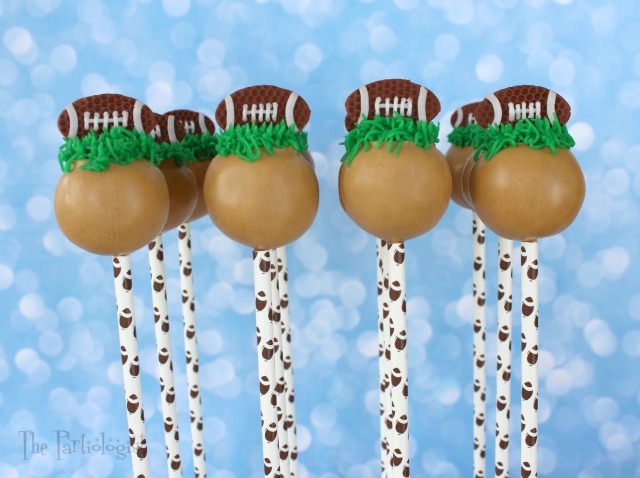 But instead, I'm showing you football cake pops. After a person burns a stadium, there is just not a lot of energy or desire to remake the cake. I barely wanted to make cake pops. But I'm not a quitter... I wanted to win you over with something before game day. After eating the salvageable scraps from the stadium, I was full and happy again. So then I begin making the cake pops. The stadium will just have to wait until next year. This year it's all about the cake pops. 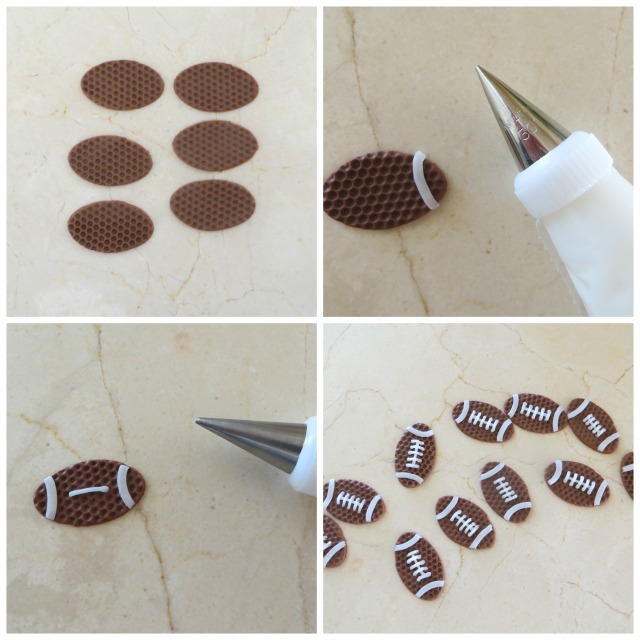 In a few easy steps, you can have a football cake pop ready before the first snap. First up, let's make the footballs. Roll out a piece of brown fondant. 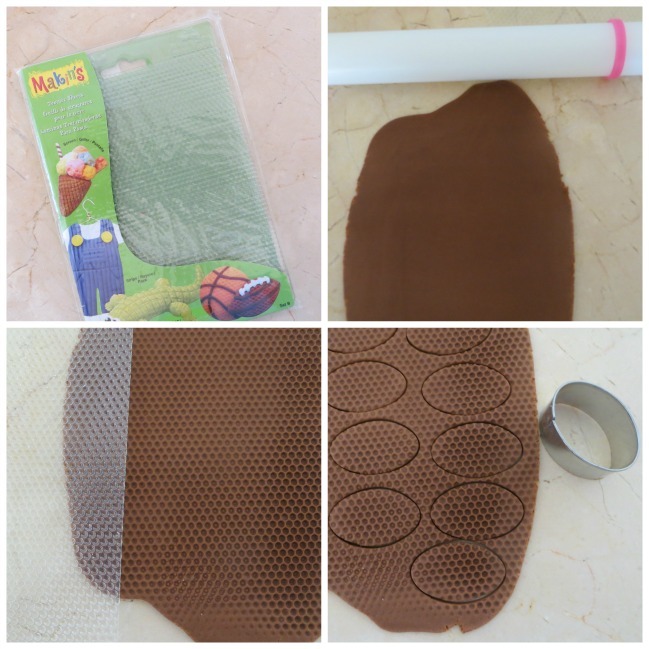 Place the Makin's embossing mat across the fondant. Roll again, making the impression of football leather. Next, with a small oval cutter, cut out the football shapes. Pipe a white line of frosting across each end with a Wilton #301 tip. Pipe a white line down the center and add the laces with a Wilton #1 tip. Set the footballs aside to dry. While the fondant footballs are drying, make a dozen cake balls using your favorite recipe. I molded the cake balls by using My Little Cake Pop mold so they were uniform in size. Next, melt a light brown candy melt. 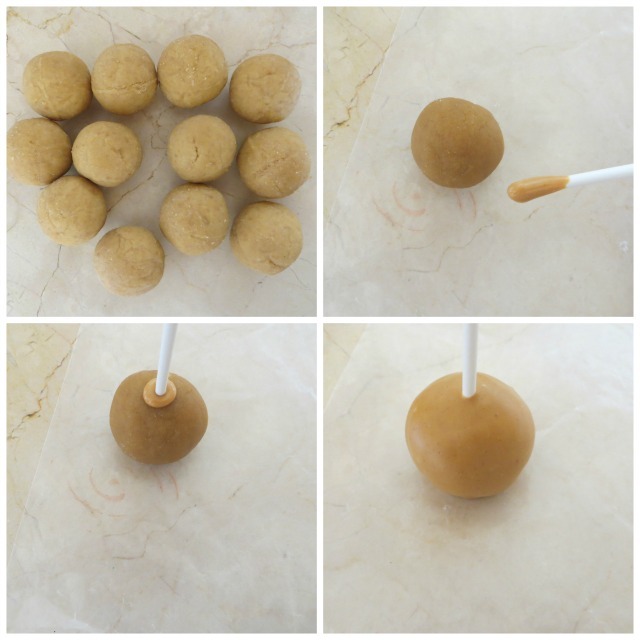 Dip the end of a lollipop stick in the candy melt and then into the cake ball. This keeps the cake ball from falling off the stick. Dip the entire cake ball into candy melts. Now it's time to add the grass to the top of the cake pop. At this point, it resembles something out of a Muppets movie. 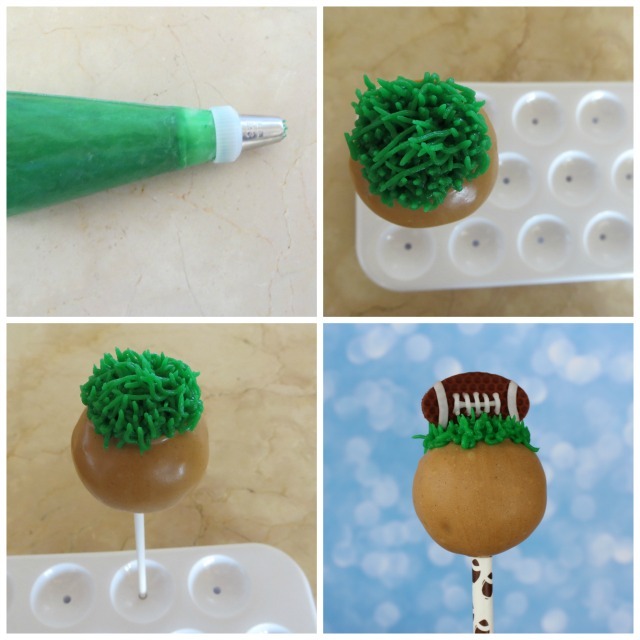 Using the Wilton grass tip, add grass just to the top of the cake pop. Cover the lollipop stick with a football printed straw. Add the fondant football and you're ready for kick off! Wishing you Family, Friends, Food and Football! Sad to hear you burned the stadium, but your creativity won out in the end. 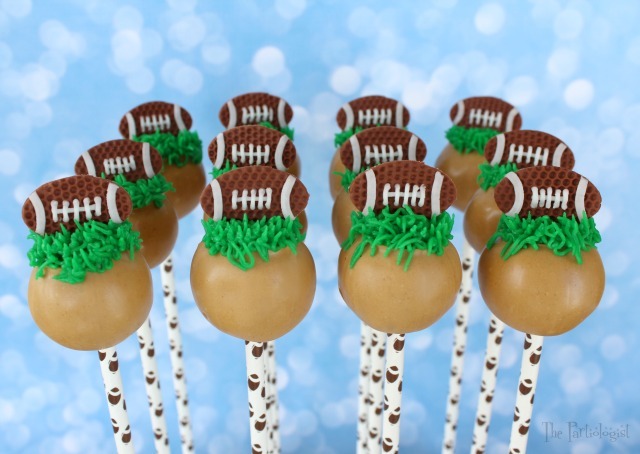 Your cake pops are not your ordinary football pops and they look great. These are adorable and much more creative than the run-of-the-mill football shaped pops! I took the easy way out and decorated my pops with the Superbowl team colors. Luckily my cake/cookie decorating store carried orange, navy blue, teal and black candy melts!